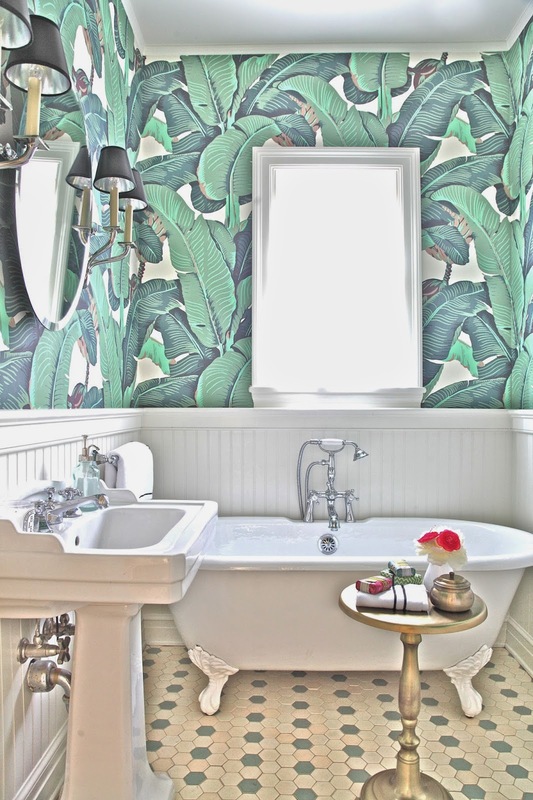 Rosa Beltran Design: JULY'S YEAR OF CHANGE DESIGNER CHALLENGE: BANANA LEAF WALLPAPER! 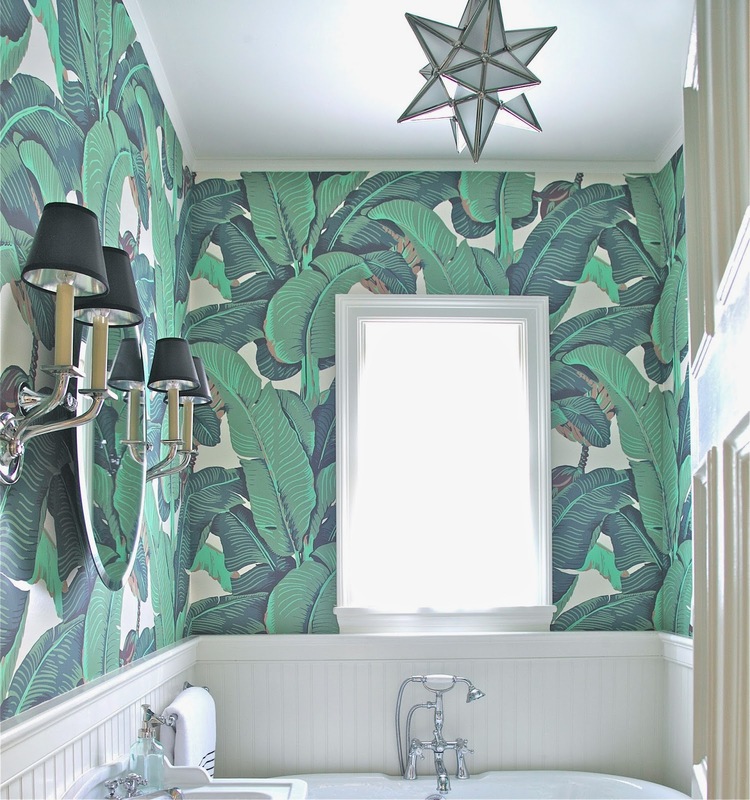 JULY'S YEAR OF CHANGE DESIGNER CHALLENGE: BANANA LEAF WALLPAPER! This month's task posed to a handful of designers participating in the monthly Year of Change design challenge was pretty general: simply to spruce up a space at home in need of some attention. As with some of the previous months' challenges, I'm in the odd position of having recently sold my house, making me an interim apartment dweller while I plan and launch the renovation of my next home. 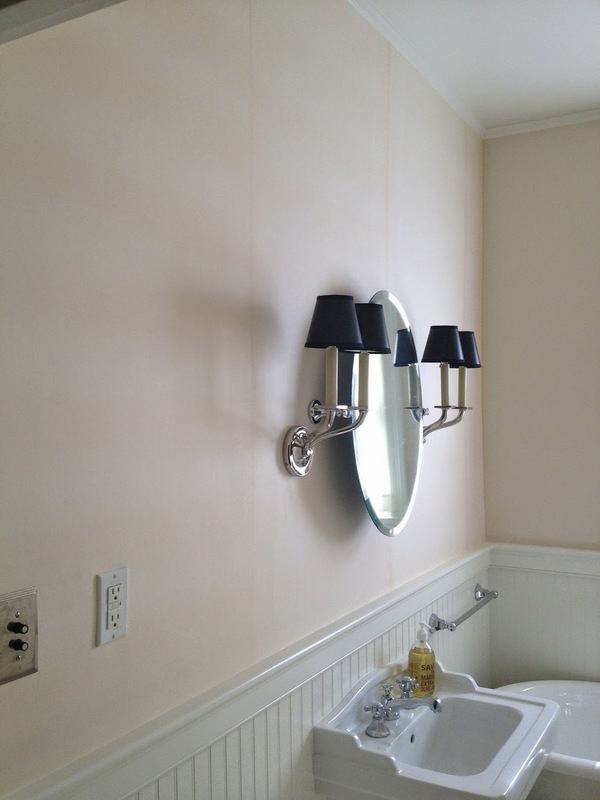 So for this month, please indulge me while I bring you a pretty sweet "before and after" of a client's powder room. I think you just might just like it enough that you'll forgive me for it not being officially (or unofficially) in my own home! 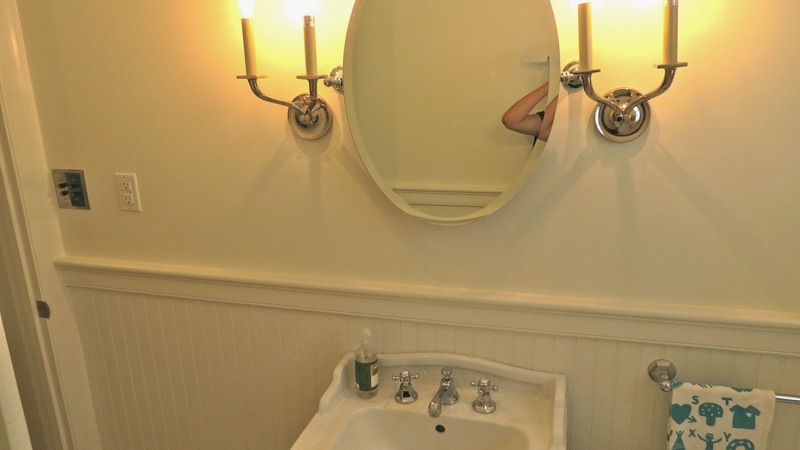 So ... here is a powder room project I did that I just love love love! Bam! 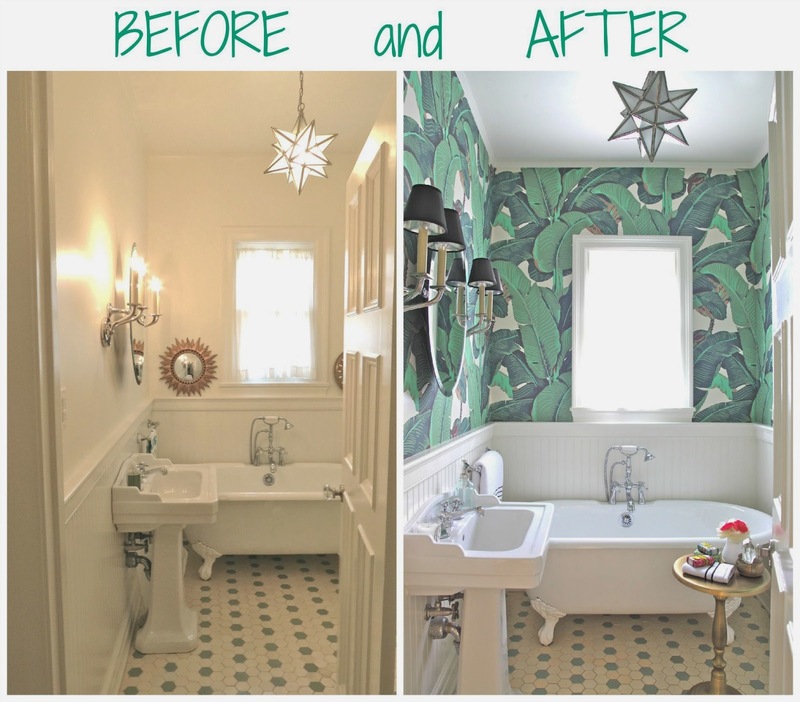 Proving that big changes at home don't necessarily require mammoth effort, I did exactly TWO things in this powder room. Hung wallpaper (which is not at daunting as it may seem ... decent diy tutorials here and here), and added black mini shades to the wall sconces. That's it. But what an impact, right!? Granted, this room already had a ton of beautiful architectural interest. 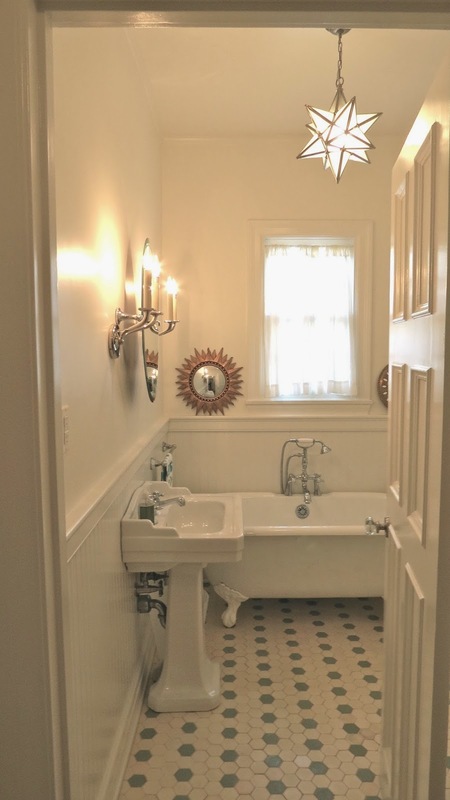 Hex tile floors, beadboard wainscoat, antique clawfoot tub, and really pretty, classy lighting. So we were not at all in bad shape at the outset. 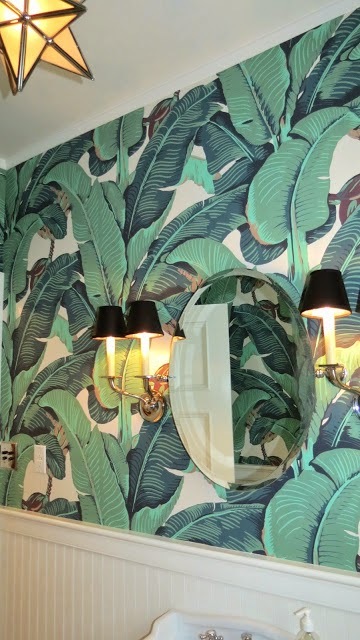 But then came that glorious palm frond wallpaper. 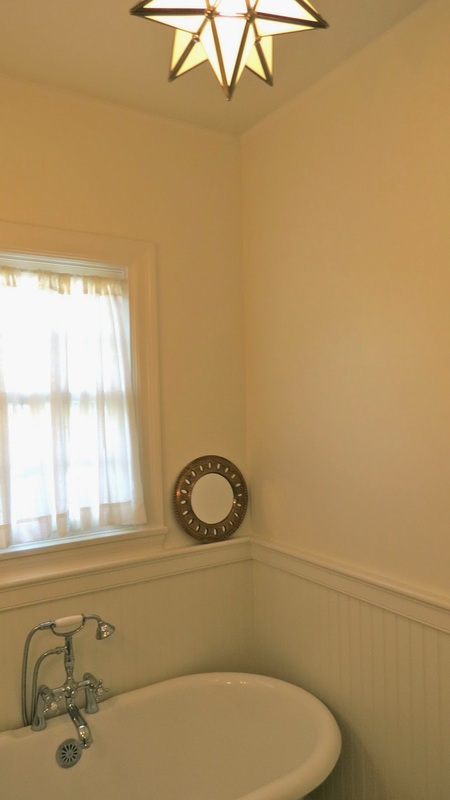 Can you even compare the impact of this room after the wallpaper to these drab before photos? No. You cannot. There's no comparison. -It's the classic, iconic "Martinique" banana palm pattern made famous in the Beverly Hills Hotel. -You can only buy it here. -It comes in a few different colorways but the "original" green I used is by far the most oft-repeated in interior design. -Read up on it, plus check out a lookalike palm wallpaper that's quite a bit cheaper here! 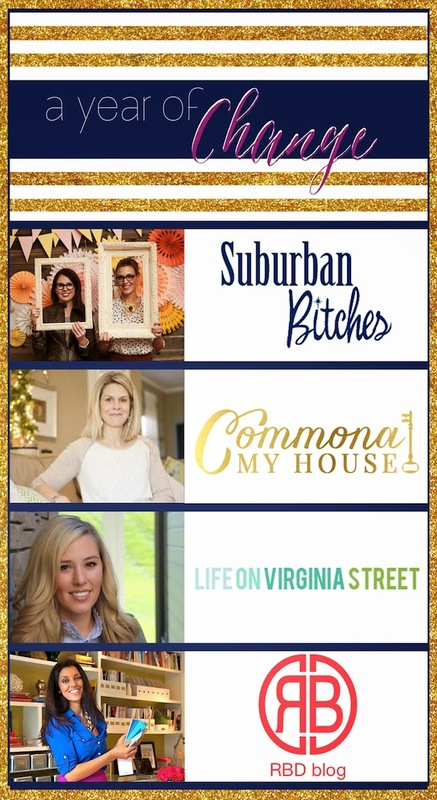 Now go check out the other designers in this challenge and see what clever things they pulled off this month! LOVE LOVE love it! I had that SAME paper planned for my bathroom! What I love is how the beadboard dilutes it a bit. Beautiful! Was it easy to hang? use paste or just water? Thanks Linda, I LOVE the way this room turned out too! The wallpaper was fairly easy to hang using standard wallpaper paste (it's not pre-pasted.) We learned that you don't need to be too too finicky about how the pattern and the seams line up because there's about an 1/8" variation, but you can't tell at all once it's all on the wall.